It's that time of the year again when everyone is starting to plan their Easter Egg hunts. 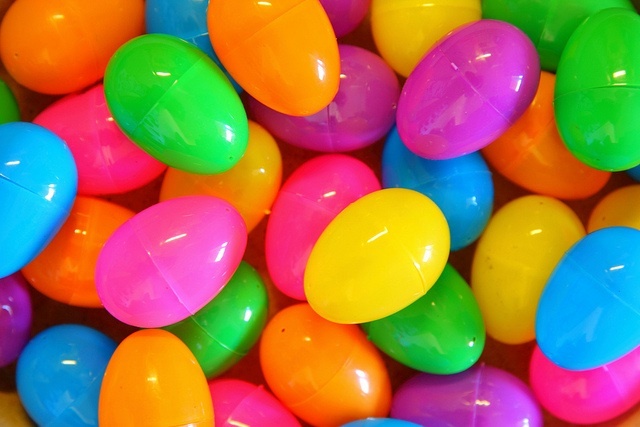 This year after many requests we are offering plastic candy filled Easter eggs in a 500 quantity bulk. Easter Egg hunts are a huge part of Easter. Many different business hold them every year. From corporations, churches, schools, apartment complexes and country clubs. Kids wait all year long for the race to hunt down their Easter eggs. Our eggs are approximately a 2 1/2" plastic hinged egg. They have 3 pieces of candy in them. The candy that is in the eggs vary. There is nothing worse then a child finding a couple eggs and opening them only to find the same ole candy in them. We use a variety of different candy when filling our eggs. You will find swedish fish, sour patch kids, frooties, taffy, sweet tarts, smarties, chocolate mini tootsie rolls, bazooka just to give you an idea of what types of candy we use. Our crew personally assembles these eggs as the orders come in to guarantee freshness so please keep that in mind when placing your orders. Once the eggs are assembled we also add a small piece of tape so the eggs don't open during shipping. Over the years we have helped many business from small to large prepare for their Easter egg hunts. Whether you need 500 candy filled eggs or 6000 we can handle the job as long as you place your order early enough. You need to take shipping time into consideration. Not only does the candy vary in the eggs, but also the colors. We mix up a selection of bold bright colors along with some pastel shades. Not only are Easter Egg hunts fun for kids, but watching them are a blast. We held an egg hunt years ago. The kids were so excited you couldn't help but smile. Oh and how they waited to hear that whistle blow. I wanted to blow the whistle to start the egg hunt so bad, however hubby was the lucky one. After watching him get practically tramped I was glad I let him do it. It was a fun day and one not easily forgotten. If you need a smaller amount of candy filled eggs no problem we also sell them by the dozen with the same great candy inside.